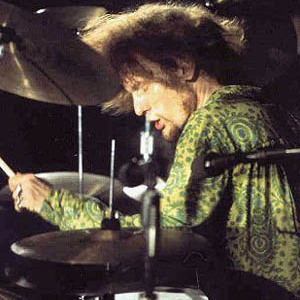 Ginger Baker was born Peter Edward Baker in Lewisham, London, on August 19, 1939. He was one of rock's first superstar drummers and possibly the most influential percussionist of the 1960s. Baker made his name on playing with the power trio Cream, which included Eric Clapton on guitar and vocals and Jack Bruce on bass, keyboards, and vocals. Ginger made top-selling records with Cream and Blind Faith for a period of only about three years at the end of the 1960s. Still, essentially every drummer for every metal band that has followed has tried to emulate some aspect of Baker's playing. His nickname of "Ginger" came along as a result of his red hair. He continues to record, primarily in the genre of jazz, though the original Cream did reunite for a brief, limited tour in 2005. Ginger Baker has played on the Public Image Ltd. recording titled Album around 1986. Baker was quoted in Rolling Stone magazine that "People say Cream gave birth to Heavy Metal, If That's so,we should have had an abortion" (Rolling Stone August 20th,2009 Issue 1085). They also ranked him as the third greatest drummer of all time. He also founded Ginger Baker's Air Force and has collaborated with Gary Moore and Hawkwind.